If you own a DR-1XE in working conditions and you are willing to switch to the DR-2XE you can trade your old digital repeater in and get an additional € 300.00 cashback. Der Kauf muss zwischen den 01/01/2019 und 30/06/2019 erfolgen. To set up a Portable Digital Node Station with the FT2DR/E, the SCU-39 WiRES-X connection cable kit accessory is required. The SCU-39 will be available very soon. Users can easily establish and operate a WiRES-X Portable Node Station by directly connecting the FT2DR/E to the PC with the SCU-39. The conventional HRI-200 internet interface kit is not required for the Portable Digital Node function, and no fixed global IP address is necessary. Since users do not need to open an Ethernet port, the WiRES-X communication from any location is possible - such as Hotel rooms, Airports, Vehicle Wi-Fi, or even Wi-Fi Access Points. With the new Portable Digital Node Function, users can gain access to WiRES-X Network directly by using the USB connected FT2DR/E with the radios PTT and microphone. The need to have an additional radio to talk to a node radio is no longer needed in order to enjoy the WiRES-X Network. The USB connected FT2DR/E can also function as an Access Point for RF communication. Four different types of operation modes are available. 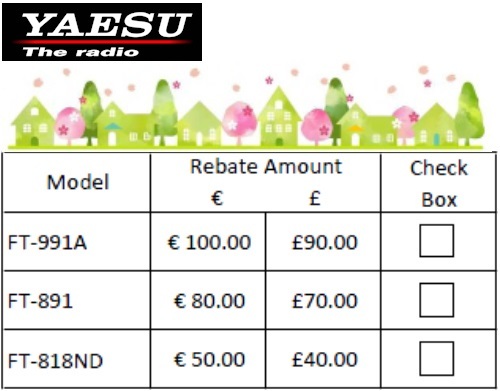 For more information, please refer to the operation manual which is posted on the official website (www.yaesu.com). Sub-code Function: When selecting DG-ID ‘00’ in the WiRES-X software (under the transceiver settings) you can select a Sub-code from “00” to “26”. When the DG-ID and sub-code are set to “00,” the node relays C4FM digital signals of all DG-ID numbers. When a sub-code is set with a value of “01” – “26,” the node relays C4FM digital signals with the subcode that is matched. This will allow multiple open nodes (DG-ID ‘00’) to work within the same communication range; this function is useful to avoid interference between nodes. With the Portable Digital Node function, the flexibility and mobility of the WiRES-X Network will be available all the time. Firmware updates will be released soon that will make it possible for the FTM-400XDR and FTM- 100DR transceivers to function as a Portable Digital Node. We believe that this new WiRES-X functionality will contribute to the growth of the YAESU C4FM (System Fusion) network and expand your business opportunities with the YAESU C4FM transceivers. Neu ab jetzt: 5 Jahre Garantie auf alle neuen YAESU Produkte!! !